What Easy WordPress Tutorial Topic Do You Want to See Next? Tell me what topic you want to see added to the collection of Free & Easy WordPress Tutorials on Business Blogging 101. Have a general question about WordPress? Ask it here. Or help to answer someone else's question! Welcome to Free WordPress Tutorials – Business Blogging 101! This video is an introduction to the Business Blogging 101 website, a site dedicated to free tutorials and support for WordPress created by Mark McLaren of McBuzz Communications. There are a few advanced tutorials. The tutorials’ degree of difficulty is determined by the amount of skill and experience you need with HTML, CSS and in some cases PHP code. If you don’t have experience with these, don’t worry! That’s the beauty of WordPress. On this site, you will learn about WordPress, Blogging and Online Marketing, including Search Engine Optimization. Ask questions, comment and connect with other WordPress users. You can use the video player control bar buttons to watch in HD and to watch in full screen mode. You can become a fan of Business Blogging 101 on Facebook. And follow Mark McLaren and McBuzz on Twitter. Results are in from my survey regarding what free easy WordPress tutorials you would like to see next on Business Blogging 101, and they are strongly in favor of an Introduction to WordPress 3.0. While I’m working on a WordPress 3.0 tutorial, I want to bring to your attention another really outstanding resource for WordPress Tutorials: the “WordPress 101” site created and maintained by Shawn Hesketh. I just signed up for WordPress 101 myself to see what’s covered. I was familiar with these tutorials already. Now they have been updated to cover WordPress version 3.0. And you can “Pay What You Wish”, meaning you pay what you feel is appropriate / what you can afford. Shawn’s video tutorial style is exemplary. Unlike some other WordPress video tutorial makers I know 🙂 , Shawn does not shoot from the hip. His presentations are polished and precise. Think about the time and care taken to make these tutorials – and how much you will gain by following them – when you decide on an amount you want to pay. (Not to mention the fact that Shawn donates half to charity!) Paying a few dollars does not get much easier – and more win-win-win – than this! So check out WordPress 101 Tutorials, and let me – and Shawn, of course – know what you think! After you have done that, I’m sure you’ll have some ideas about other things you would like to know about WordPress 3.0 – and Free, Easy WordPress Tutorials on Business Blogging 101 will be happy to deliver. Free WordPress Tutorials: Business Blogging 101 is getting more visitors than ever. WordPress 3.0 is out and flourishing (because it ROCKS). The new default WordPress theme, Twenty Ten, is more WordPressy AWESOMENESS. There has even been a recent resolution to an ongoing disagreement about the General Public License and Thesis WordPress theme. With all this going on, I feel a need to create some more easy WordPress Tutorials that will add to the growing list and help more people discover and learn to use WordPress. Use the Poll above to vote or nominate your own WordPress tutorial topic. I haven’t tried this kind of WordPress/Polldaddy poll before, but I’ll add your suggestions if several people list the same one or something similar. Feel free to include your own ideas for WordPress tutorials in more detail using the comment form. UPDATE: Votes for the next easy WordPress Tutorial topic are already coming in. Thanks, everyone! I need more votes, so tell a friend! I’m using a PollDaddy poll, which is really easy to do on WordPress.com. There’s also a PollDaddy plugin you can use to create polls and surveys on a self-hosted WordPress site. My poll has an option for “Other” so you can write in your own topic if none of my suggestions sounds good. 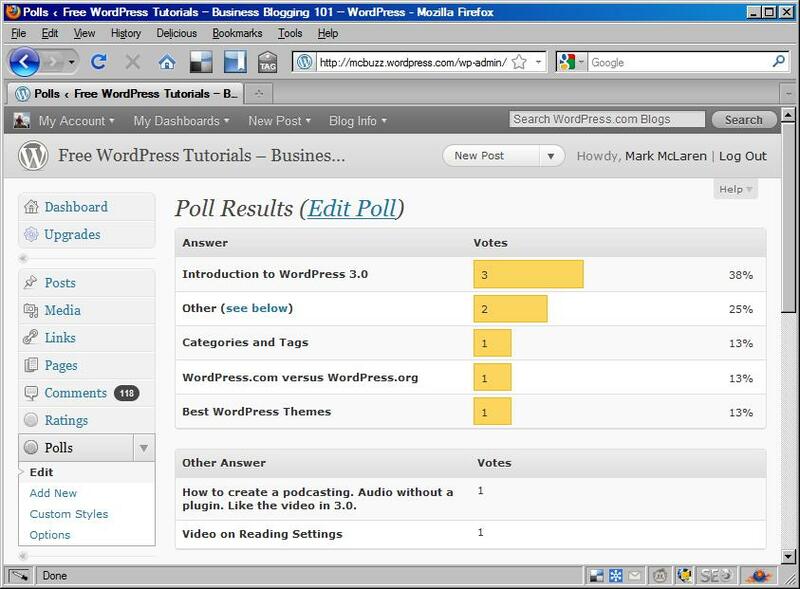 Here’s how the poll results look when you view them in the WordPress Dashboard. Pretty darn cool! On Tuesday, May 11 in Bellevue (Seattle), Washington, you can hear me (Mark McLaren) and two other WordPress experts talk about 1) WordPress for Business Websites, 2) the latest version of WordPress (3.0), and 3) Search Engine Optimization (SEO) for WordPress. It’s an evening event at Bellevue College, with plenty of time for Q & A and networking. Anyone who wants to learn WordPress, or learn more about WordPress – definitely check it out! I will be doing the WordPress Search Engine Optimization presentation. You’ll get all you need to take your WordPress website from the basic default level of search optimization to a truly optimized level using the “All in One SEO Pack” plugin for WordPress. The SEO techniques I’ll talk about work on any website. I’ll just be showing you how to apply them quickly and easily to your WordPress site. To sign up now, visit the Seattle WordPress seminar website. Feel free to contact me with questions about the event. For tickets and more information, visit the Seattle WordPress seminar website. The organizers of WordCamp Seattle 2009 will meet some time this month to discuss the 2010 event. Look for updates on the WordCamp Seattle website. You can also follow WordCamp Seattle on Twitter. My company, McBuzz Communications, helps business and individuals with WordPress websites in Seattle and around North Amercia. I had the honor of being one of the speakers at WordCamp Seattle 2009. Thanks in part to votes from Business Blogging 101 fans, I also got to do a 5-minute Ignite-style presentation on WordPress and the Social Web. It was a blast. Really looking forward to 2010. Do you prefer video tutorials or text tutorials? There’s a discussion on the blog of Jaap Haitsma with participants expressing an overwhelming preference for text tutorials. Business Blogging 101 is mostly video tutorials. Although, when I started making tutorials for WordPress in 2007, I used text instructions and screen captures. Hey WordPress lovers, it’s time for the Crunchies Awards! Vote for WordPress as best Internet App of the year. McBuzz and Business Blogging 101 voted, have you? I'm an online marketing consultant in Seattle. Search Engine Optimization and Social Media Marketing are my focus. If you find these tutorials useful, please consider making a donation to Business Blogging 101 through the McBuzz Communications website. Donations made to Business Blogging 101 help to grow the collection of free WordPress and Web Marketing tutorials available here.